A handful of companies dominate the global market for hepatitis E diagnostic tests. Beijing Wantai Biological Pharmacy Enterprise Co. Ltd., among them, is the dominant player that accounts for around 30% of market share. The other key players in the market are Fortress Diagnostics, Mikrogen, Biokit SA, MP Biomedicals, Altona Diagnostics, and Fast-track Diagnostics. Competition among them is robust and going forward is slated to intensify further on account of competitive pricing strategies leveraged by them. There is just a small proportion of products have been approved for commercial use in the global market for hepatitis E diagnostic tests. In fact, all products in the U.S. serve only research purposes. On account of a lesser number of products available, the bargaining power of buyers is relatively limited in the market. 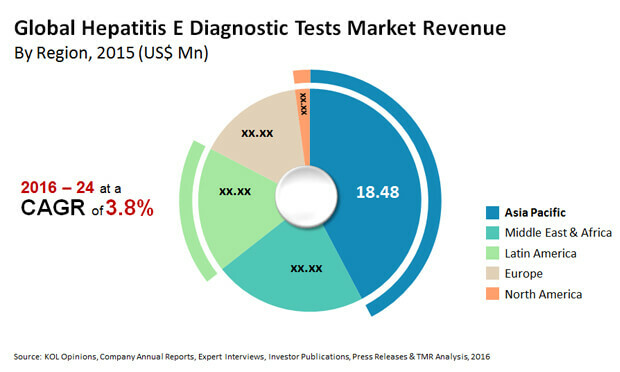 A report by Transparency Market Research forecasts the global market for hepatitis E diagnostic tests to attain a value of US$60.43 mn by 2024-end, rising at a steady CAGR of 3.8%. The different types of hepatitis E diagnostic tests are ELISA HEV IgM, ELISA HEV IgG, RT-PCR, etc. Among them, ELISA IgM kits is predicted to see maximum rise in demand in the foreseeable future on account of its use in detection of acute hepatitis E infections. Initiatives to raise awareness among people is also expected to stoke demand. This segment is expected to expand at a CAGR of 4.2% from 2016 to 2024. Based on geography, the key segments of the global market for hepatitis E diagnostic tests are North America, Latin America, Asia Pacific, Europe, and the Middle East and Africa. Asia Pacific, of them, dominates the market with maximum share which is predicted to increase further to 48.4% by the end of 2024. Stellar performance in the market in the region has been brought about by hyper-endemic sero-prevalence of the disease in South and East Asia, periodic outbreaks of the malady, and its high prevalence among pregnant women. The most prominent growth driver in the global market for hepatitis E diagnostic tests is the high prevalence of hepatitis E worldwide. As per WHO, about 20 million HEV infections happen annually, worldwide, of which round 3.3 million develop into symptomatic cases. Besides, increase is global tourism has also upped the occurrence of hepatitis E as people travelling to regions where the disease is endemic or hyperendemic often contract for it can be spread through consumption of contaminated water.